Post a Confined Space Tag at entrances or access points to assist your compliance with 29 CFR 1910.146. 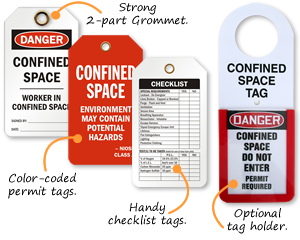 • Find both OSHA Confined Space warning tags as well as Checklist tags. The tag becomes your Permit form itself – or, for some, a reinforcement of your current Confined Space procedures. The checklist helps prevent needless and unprepared entry. • A Confined Space Tag holder is an ideal way to create a system. You can swap out different confined space tags using the holders’ “Kangaroo” pouch, depending upon the status. With no tag, the “DO NOT ENTER” message is displayed. • Confined Space Tags are available in a range of materials, from low cost 10 mil plastic to our heavy duty / sealed 30 mil tag. Reinforce your Hot Work procedure with a bold tag. Prevent unauthorized people from endangering your workers. Our 5.875” x 3.375” tags are designed to fit into these holders. By changing the tags, you can quickly display the status of the work in the Confined Space. These holders are especially popular with Entry Permit and Atmospheric tags – and with the color coded status tags. Insert these tags into tag holder above. Or, use these color-coded status tags by themselves. See, at a glance if it is safe to enter.